The Historic Centre of Vienna has immense significance to Europe’s tangible and intangible culture, as a city of great architectural importance and as an exceptional centre for the development of arts, in particular music, painting, architecture and literature. It was inscribed on the UNESCO World Heritage List in 2001. Founded by the Romans, Vienna developed throughout the Medieval and Baroque periods and has since grown to become an exciting city with breathtaking architectural ensembles. As the capital of the Austro-Hungarian Empire, Vienna became known as a centre of influence namely for all central and eastern Europe, and this heritage remains fundamental to the city’s identity today. The architectural monuments of the historic centre reflect the historical, artistic and cultural dimensions of the former capital and imperial residence, of a true European metropolis boasting world-famous museums and collections. The Ringstrasse – a masterpiece in urban planning – was built in the second half of the 19th-century along the line of the previously demolished walls. It is located on the former Glacis area and is lined with the city’s most important public buildings, monuments, parks and palaces. In 2012, a high-rise development, which will include the rebuilding and enlargement of the Hotel Intercontinental, was planned on the site of the Vienna Ice-Skating Club. The development would totally spoil one of the most important and famous views of the city from the Baroque-era Belvedere Palace and Gardens. 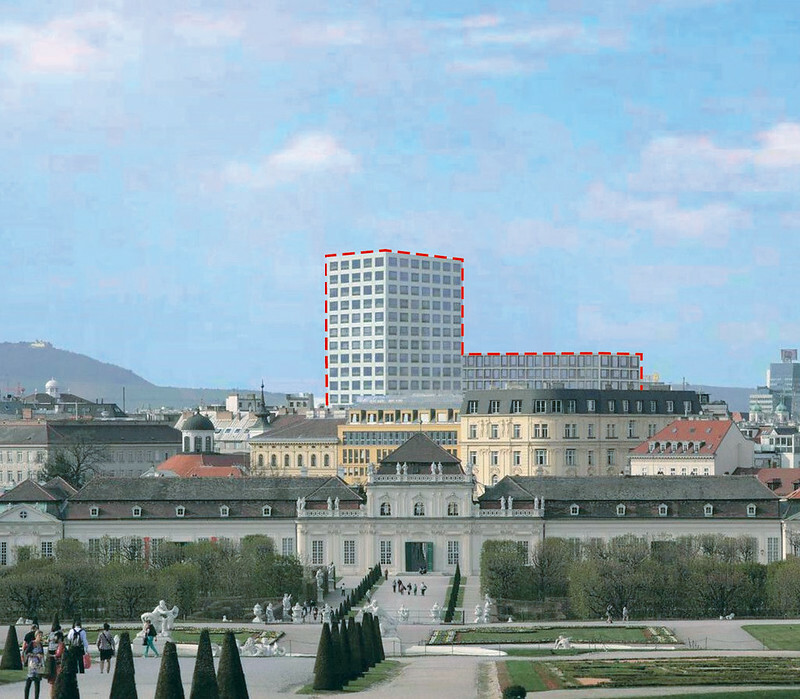 In 2014, the City Council of Vienna issued a “High-Rise Concept” and a “Glacis Master Plan” which permit the construction of high-rise buildings on several points of the Ringstrasse area, within the limits of the World Heritage Site. These high-rise buildings would spoil the urban form and character of this area as well as the roofscapes and morphology of the Historic Centre of Vienna. Following numerous and unfruitful exchanges with Austria and the Vienna City Council since 2012, the World Heritage Committee, at its 41st session in July 2017, inscribed the Historic Centre of Vienna on the List of World Heritage in Danger. Europa Nostra had previously expressed its dismay regarding these threats, underlining in March 2017 the serious concern already expressed by a group of ICOMOS National Committees about the risk these plans present to this sensitive area of European significance. Europa Nostra has urged all stakeholders to bring the project in line with the recommendations of UNESCO and ICOMOS Reactive Monitoring Mission report. In addition, the experts from Europa Nostra and the European Investment Bank Institute hope that in inscribing the Historic City of Vienna on the list of 7 Most Endangered 2018, the City Council of Vienna and the developers will reconsider their decisions. The nomination for the 7 Most Endangered programme was made by Europa Nostra Austria.